What is the "right" time, especially in a world in which "time" is adjusted according to the seasons? Here in Britain, until the 1840s and the development of the railways (and the need for timetables), each town or city kept its own time, which differed, sometimes by ten or more minutes, from the time kept elsewhere, and particularly "London Time", as set by Greenwich. Even after railway clocks were synchronised with Greenwich Mean Time, many towns refused, sometimes for decades, to alter their other public clocks, their residents presumably developing mental clocks which recalculated time if they needed to catch a train or keep an appointment in town. To this day, a type of "Oxford Time" still exists, thanks to the clock on Tom Tower, still stubbornly and quaintly five minutes ahead of the rest of the country. A few other clocks in Oxford also ring out different times; thus I soon learnt to recognise peals and knew without needing to check my watch how fast or slow each one was. But in fact, while I lived there my own home was a microcosm of Oxford's many clocks, though rarely in synch with any one in particular! What, exactly, is "standard time" or even the "correct" time, when laptop, phone, alarm, cooker, microwave, tablet and God knows what else each manage to differ from each other, sometimes by a few minutes? And when these differ from my watch and car clock? Yes, I could of course have synchronised everything with Big Ben, but modern appliances are rarely straightforward, and all this would be time-consuming. Much easier to do as those Victorians did, and simply get used to remembering by how much each device is fast or slow, and make my mental adjustments accordingly. 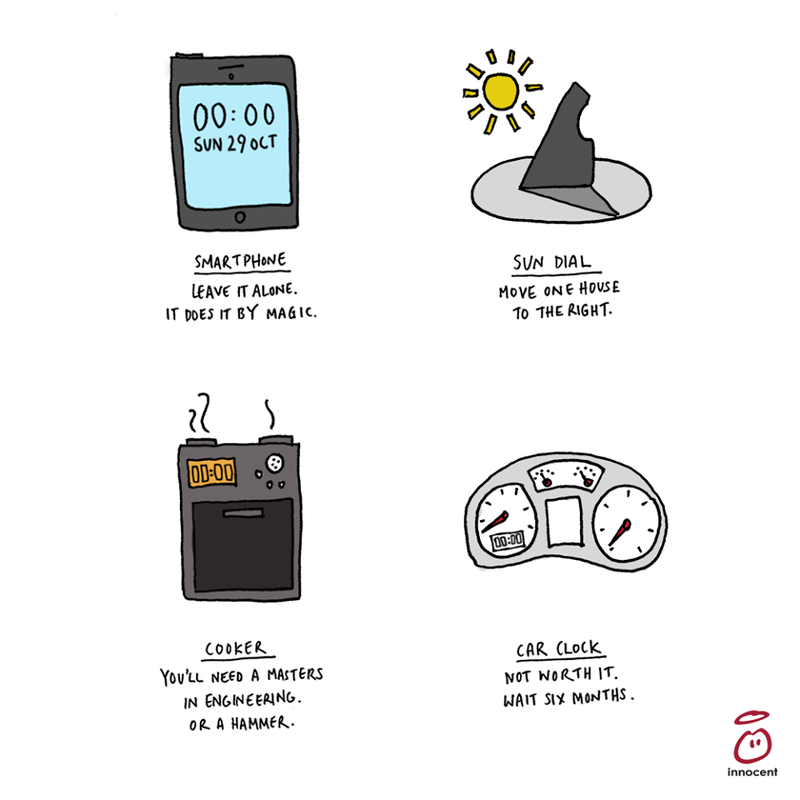 Last night here in the UK we did our twice-annual exercise in playing with time, and set our clocks back one hour to Greenwich Mean Time. Even though temperatures here in London are still in their early teens and the days are intermittently sunny, we bid farewell to British Summer Time for six months, ushering in early dusks and long nights. Not so long ago this adjustment simply meant turning little knobs on clocks and watches - or, in the case of older timepieces, opening the front glass casing and moving the minute hand back or forward. But as this little cartoon from Innocent Drinks reminds us, modern life is somewhat more complicated: some devices do automatically reset themselves by magic, while with everything else it's all too easy to accidentally reset the oven timer instead of its clock, or plunge something into a completely different time zone.